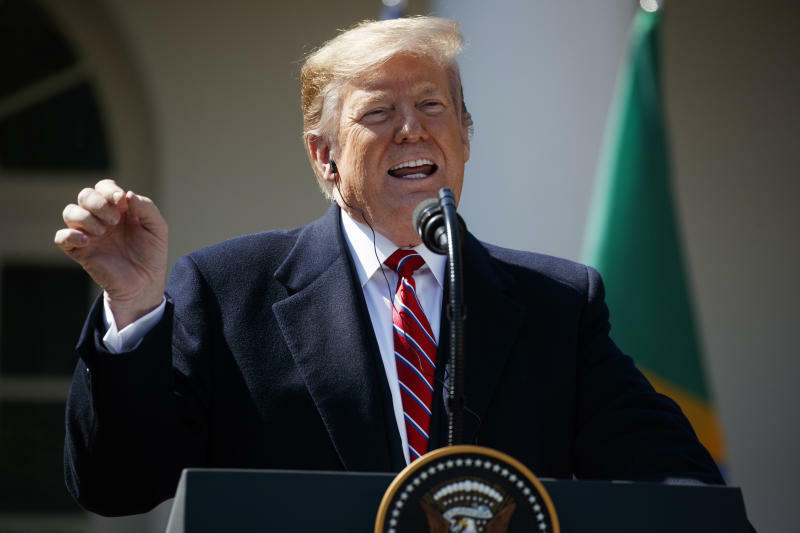 WASHINGTON (AP) — President Donald Trump directed his ire Tuesday at the nation's major social media companies, claiming they're biased against Republicans and attacking them with the same gusto he uses for much of the rest of the media world. Trump's focus on social media began with a morning tweet and continued into a press conference with Brazilian President Jair Bolsonaro, where he reveled in the rightwing leader's use of Trump's trademark phrase "fake news." Trump's complaints come after he spent much of the weekend on Twitter, where he attacked a litany of targets including the late Sen. John McCain of Arizona, General Motors and "Saturday Night Live." "It seems to be if they're conservative, if they're Republicans, if they're in a certain group, there is discrimination and big discrimination," Trump said of the tech giants. "I see it absolutely on Twitter and Facebook." While some tech company executives may lean liberal, they have long asserted that their products are without political bias. Twitter disputed the president's contention Tuesday, with a company spokeswoman saying "we enforce the Twitter rules impartially for all users, regardless of their background or political affiliation." Trump's comments came in response to a question about whether he could go along with legislation to make social media companies liable for their content on their platforms. Trump and some supporters have long accused Silicon Valley companies of being biased against them. "Well, we have to do something. I tell you I have many, many millions of followers on Twitter, and it's different than it used to be," Trump said. "Things are happening. Names are taken off. People aren't getting through." Social media companies have taken considerable criticism since the 2016 election, when they were played by Russian agents seeking to sow discord among U.S. voters. The technology giants have thrown millions of dollars, tens of thousands of people and what they say are their best technical efforts into fighting fake news, propaganda and hate speech that has proliferated on their digital platforms. Conservatives are complaining that those steps are disproportionally aimed at their side of the political spectrum. Trump's social media director Dan Scavino posted on his Facebook page this week that he had been temporarily blocked from making comments. Trump tweeted that he would be looking into it. Facebook released a statement saying it has been in touch with Scavino. It explained that limits it has put in place to stop automated bots can have unintended consequences on real people like Scavino, but generally lift in an hour or two. "We've been in touch with him and have apologized for the inconvenience," Facebook said. Rep. Devin Nunes, R-Calif., is suing Twitter and several of its users for more than $250 million, accusing them of defamation and negligence. The suit filed Monday in Virginia accuses Twitter of "knowingly hosting and monetizing content that is clearly abusive, hateful and defamatory." Shadow banning allows users to post freely — but no one else sees their messages. Twitter has denied doing it, although some political conservatives remain unconvinced. Trump tweeted earlier Tuesday that "Facebook, Google and Twitter, not to mention the Corrupt Media, are sooo on the side of the Radical Left Democrats." He told followers not to fear. "We will win anyway, just like we did before! In his press conference, Trump claimed without citing evidence or names that "executives of the various companies" have a hatred for "a certain group of people that happen to be in power, that happen to have won the election." "So something's happening with those groups of folks that are running Facebook and Google and Twitter, and I do think we have to get to the bottom of it," he added. Associated Press technology writer Barbara Ortutay contributed to this report from San Francisco.